Experience a whole new way of mobile computing while on the go with Apple iPad Wi-Fi Tablet. 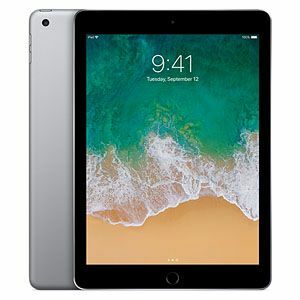 This tablet features Apple A9 chip with 64-bit desktop-class architecture to deliver incredible mobile computing performance for non-stop multimedia and gaming entertainment. Its impressive and responsive 9.7” multi touch screen and 2048×1536 resolution provides razor sharp images for an enhanced visual experience, allowing you to enjoy watching your favorite movies and other multimedia application in stunning clarity and detail. It is equipped with a staggering 32GB of Storage Capacity for your files, documents and other multimedia content. Running on iOS 11 Operating System, it brings new innovative browsing experience and access to built-in apps and over thousands of apps from the App store. Moreover, you can get high speed wireless network access using its ultra-fast WIFI IEEE 802.11a/b/g/n/ac LAN Standards. Plus, you can easily and quickly share the content with compatible devices using the Bluetooth 4.2 technology. This Apple Tablet can now be secured with the FingerPrint Identity Sensor and also has other features like the 8MP Rear Camera and 1.2MP Front Camera. Grab the Apple iPad Wi-Fi Tablet today!Buy the Apple iPad Wi-Fi Tablet – MP2F2LL/A at a super low price of $299. TigerDirect.com is your one source for the best computer and electronics deals anywhere, anytime.